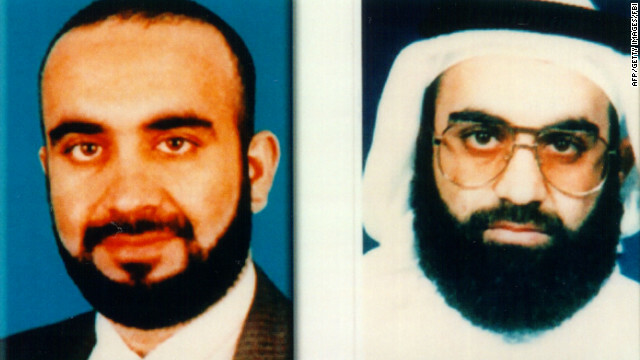 Four years after political opposition killed his plans to try Khalid Sheikh Mohammed and other alleged 9/11 plotters in civilian court in Manhattan, Attorney General Eric Holder says: "I was right." Continued delays in the military trial of Mohammed and four others at the U.S. detention facility in Guantanamo Bay, which may not start until 2015, proves his point, Holder said Monday, interjecting a "not to be egocentric about it" qualifier. "The defendants would be on death row as we speak" if his plan had been carried out, Holder said. Holder's KSM trial plans were announced in late 2009, and the attorney general quickly lost the political fight, though he kept clinging to the idea for another year. Many Republicans in Congress rose up against the idea because they said it would endanger the U.S. and because they oppose closing the Guantanamo prison. New York Police Commissioner Ray Kelly said it would cost hundreds of millions of dollars to secure the federal courthouse area, and announced plans to cordon much of lower Manhattan in security checkpoints. White House officials refused to allow Holder to defend his plan, while Republican lawmakers and community groups in lower Manhattan, gathered steam in opposition. White House officials feared the KSM trial would distract from the president's goals of passing his healthcare law and other political priorities. Holder said Monday that it's now clear, a civilian trial would have been better for the country and wouldn't have required a $200 million security blanket nor a shutdown of lower Manhattan. He said the episode is a reminder of what happens when politics are allowed to intrude on law enforcement matters. Holder was speaking at a press conference to announce an unrelated criminal and civilian settlement against drug company Johnson & Johnson. Holder's right. And by the way, the trial does not have to be publicized. Removing the publicty depriives Al Queda another public platofrm. So, I say go ahead & try him – near the site of his mass murder – and let justice prevail. Sec Holder is a disgrace. He should have been removed from office four years ago. He was not correct in this case. He is little more than a shake down artist. Im with the why give a trial crew. If we are plucking them from active warzones they are fighting a war, we shouldn't capture so many and when we do they should be unlisted. They really should have been shot on sight. Why even bother give them trial of tax payer money. Let them slowly rot in Guan. Heh, not everyday you can give praise to Holder, but in this case he was correct. Khalid's trial proved that under american justice you can still try and convict evil terrorists of their crimes Const-itutionally without need of suspending their right to a trial nor needing the indefinite detention clause of NDAA. Heck you do not even have to make it secret or do it in secret courts. These people are easily convictable under America's laws. However there is a flipside to this in the long term that the GOP does have one good point on. Where are we going to house some of the world's most infamous villains? If we shut Gitmo and try them in US courts does this imply they have certain rights the same as American citizens who are prisoner and also must be housed within America when many of them are straight up foreigners, or must we send them back to their home countries that will esentially turn them into folk heroes and set them free? The right to a fair trial isn't guaranteed only to US citizens. Foreigners who break our laws are afforded those same rights. I would agree that housing them with the general prison population isn't the best idea, but holding them forever without a trial goes against US principles.